In December, 2014, we at Color of Words Inc will begin celebrating our 10th anniversary. As part of our celebrations, we will continue providing free domestic shipping of our line of prints, catalogs, and scarf. In November, we will report about Wosene’s upcoming exhibitions in 2015. Be sure to check back regularly and get updated news on his events. Beginning this month, October, Wosene’s prints are now available at Kokopelli Gallery in St. Helena, CA. If you’re traveling in the California wine country, be sure to stop by Kokopelli, meet Steve Hill, and see Wosene’s prints, including his newest print, Color of Words VI. Also check the Color of Words Shop to see new limited editions we’ve included. Seventeen new and recent paintings from Wosene’s acclaimed series, WordPlay, are featured in a solo exhibition at the Sharjah Museum Calligraphy Biennial, from April 2 – June 2, 2014. Wosene has been invited to show his works in this prestigious exhibition in the Sharjah Emirate, which has been named the Islamic Cultural Capital of 2014. In addition to exhibiting his works, Wosene will present a slide/lecture during the week-long celebratory events on the development of script images in his four major series: Graffiti Magic, Africa: The New Alphabet, Color of Words, and WordPlay. He will also present a hands-on workshop on creating compositions using script/word-forms. This sixth Calligraphy Biennial is presented by the Sharjah Government, Department of Culture and Information, Directorate of Art. On Thursday, June 27th, the Gallery of African Art, 9 Cork Street, London (Mayfair district) opened Wosene’s major solo exhibition of sixteen large works, curated by Raku Sile (London) and Mesai Haileleul (Los Angeles). Boasting two floors of exhibition space, the Gallery welcomed a full house of guests, collectors, and journalists. The exhibition WordPlay continues until July 26th, 2013. To contact the Gallery, email: info@gafraart.com, or phone: +44 207 287 7400. 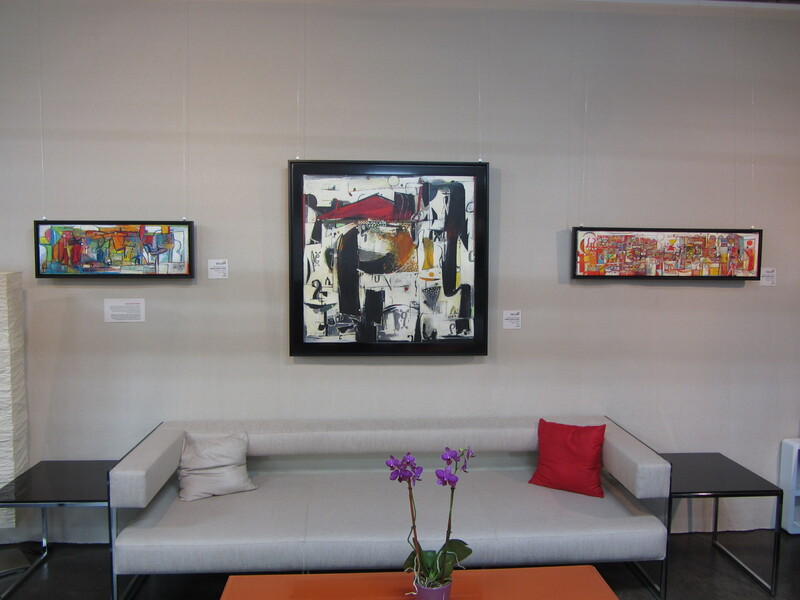 Wosene’s paintings are now in Calgary! Presented at Design By Brown/The Gallery, Wosene’s recent works – chosen by Lee Brown and The Gallery art director, John Strawn – can be seen throughout the summer. Brown, a well-known designer, has as his mission “…to combine an artist’s vision with leading industry technology to revolutionize the look and feel of any space.” Wosene is pleased to have his work presented with Lee’s innovative and elegant interiors. In late July through the end of August, John Strawn will direct The Gallery, which features many of Wosene’s small and mid-size paintings. John is also the owner of Loft Galeria in Puerto Vallarta, Mexico, where he had a major exhibition of Wosene’s work in February, 2013. On Friday, May 10th, Wosene will open an exhibition of recent paintings at Madelyn Jordon Fine Art in Scarsdale, NY. If you live in NYC or will be visiting the area, be sure to attend the opening to view new works Wosene is preparing for that show. To get time of the opening and location, please contact Madelyn at <mrjart@aol.com> or phone her at 914.723.8738. Wosene will have three paintings in the online VIP Art Fair that takes place from February 1-17, 2013. 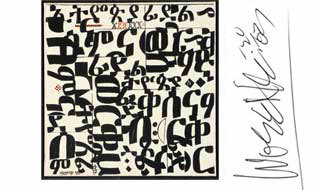 Kate Cowcher: “WordScapes: Wosene Worke Kosrof.” In: African Arts, Volume 45, Number 4, Winter 2013, pp.86-7. To order the journal, contact: journals-orders@mit.edu. Christine Mullen Kreamer and Allyson Purpura: “Visual Poetry/Performing Script.” In: Nka: Journal of Contemporary African Art. Volume 31, Fall 2012, pp. 124-140. To order the journal, contact: dukeupress.edu/nka. on Wednesday, February 13, from 6 – 9 pm. For more information, visit the gallery’s Web site: www.TheLoftGaleria.com. Thursday, February 14 at noon, in conjunction with his exhibition at The Loft Galería, Wosene will present a slide-lecture at Peter Gray Museum in Puerto Vallarta, for Central Coast University students and the local community. This website and all works in it ©2000–2019 Wosene Kosrof and Color of Words, Inc.